Playing video games on your TV or iPad will never feel quite as rewarding again after you watch this video. 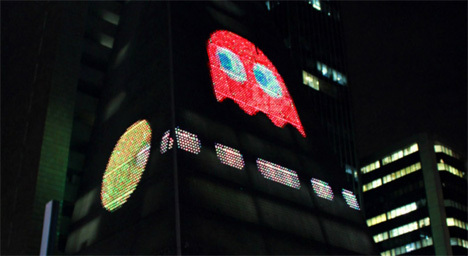 A group of digital artists took over a building on one of Sao Paulo, Brazil’s busiest streets in April 2013 and turned it into the world’s largest interactive arcade. The gaming surface took up the entire facade of the building – around 30,000 square feet. Passers-by could use their iPads to control some old-school games like Pac-Man, Space Invaders and Tetris. While it would be undoubtedly awesome to play on such a gigantic surface, people who got to play with the big arcade said it was a bit intimidating to have everyone on the street watching their performance. 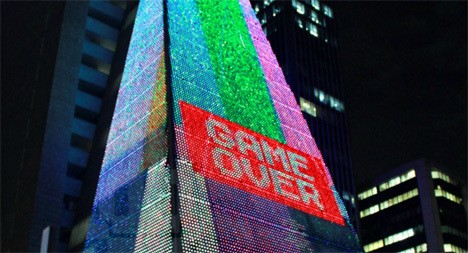 We can’t say we blame them – we never could get that last guy on Space Invaders. See more in Gaming & Geek or under Gadgets. June, 2013.